Six poses that will help you fall asleep instantly. seems to be helping and here's where yoga can come to the rescue. There are certain poses that can calm your nervous system relieve stress and relax you within seconds. The six asanas we're about to share with you can all be done in the comfort of your own bed. Right before you hit the sack. You ready to give them a shot? Well grab your PJs, and let's get to it. All right before we jump into the poses always remember to consult a doctor before you try any kind of physical activity, especially yoga. Some poses can be dangerous for pregnant or menstruating women. Also, if you have any sort of injury or health condition, check with a medical professional before you give these poses a try. Now, if the above doesn't apply to you then let's get on with it. #6 Legs up the wall pose. alongside your body with your palms facing up, stay in this position for two minutes. In the yoga world, this pose is called the "Viparita Karani" which translates as "Reversed Action". Menstruating women are advised to refrain from this pose as well. Yoga experts say that Viparita Karani prevents anxiety arthritis, digestive problems, headache migraine, and insomnia. It's a restorative pose that calms the mind, relieves lower back pain, and soothes swollen feet and legs. All done with this one so let's move on to the next. The yoga term for this pose is Salabhasana, which literally means locust or grasshopper pose. Not only does it help you sleep like a baby, but it's also good for those who have problems with flatulence, constipation, indigestion, and lower back problems. Locust pose also boosts metabolism enhances blood circulation improves posture and reduces stress. Just don't try it if you have serious back problems neck or spinal injuries or you have a headache at the moment. Also, wait until you fully digest your dinner at least four to six hours before bedtime. Pregnant women must avoid this one for well obvious reasons. All right we know the benefits and at-risk groups, let's give it a try already! Lie on your stomach with the pillow resting vertically under your hips and chest, lock your fingers behind you, now take a deep breath in lift your upper body, and reach your hands towards your heels, slowly lower your chest back down and exhale think you can do 10 wraps just remember to take it to slow, okay! #4 Wide-angle seated forward bend pose. good stretch, strengthens your spine, stimulates your abdominal organs, and calms your mind and body. should also skip this pose. If none of that concerns you then, let's try it! Sit down with your legs spread wide apart and put a pillow in front of you, straighten your back and inhale as deeply as you can, then as you exhale slowly stretch your arms forward lowering your to the pillow, while you're in this position inhale and exhale ten times and then slowly go back up. #3 Reclining bound angle pose. Lie down facing up with a pillow placed vertically under your back, bring your feet together and spread your knees out to the sides, relax your arms alongside your body with your palms facing up, breathe deeply and evenly, stay in this position for three minutes. The official yoga term is "Supta Baddha Konasana". Not all of us can stretch like a gymnast like in that pose so this one might be a little easier for you. It's also called the reclined goddess pose or reclining butterfly pose. Keep in mind that you shouldn't do this one if you suffer from knee, lower back, groin, shoulder, and hip injuries. Pregnant women or those who have just given birth should avoid it as well. What can you gain from posing like a frog? Well, this yoga pose reduces stress in the nervous system, relieves tension, and improves blood circulation. Which is the key to restful sleep. If you have to sit or stand a lot throughout the day it gives your groin, knees, and inner thighs a much-needed stretch. This pose is also good for insomniacs or people with mild depression. It can also treat digestive problems, infertility, menstrual disorders, and irritable bowel syndrome. Alright, froggies let's move on to the next pose! Lie on your back, bend your knees and bring them together. Slowly tilt your legs to the side holding them down with your hands, stay like this for one minute and then change to the other side. Translated from the Sanskrit "Jathara Parivartanasana" This pose targets your abs, obliques, hip abductors, and hamstrings. Physiologically it helps digestion by improving your liver, pancreas, and small intestine. It's also perfect if you're stressed or tired as it rejuvenates the body. shouldn't try this one either. Sorry ladies! Lie comfortably with your back supported by a pillow, spread your legs ever so slightly and rest your hands, palms up out to the sides of your body. Make sure that your spine and head are in line. Take three deep even breaths in and exhale through your nose. Then take four ordinary ones. By this point, you'll feel sleepy and you'll be sawing logs sooner than you think. Once, you're in position, go ahead and give this one a go for the next two minutes. In yoga speak it's called "Savasana". 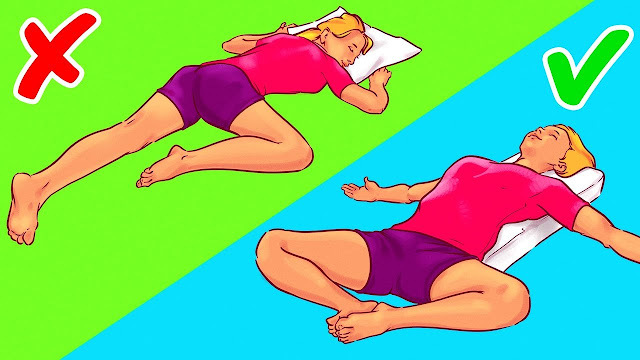 Corpse pose is perfect for those who have trouble falling asleep. I mean who sleeps better than the dead right! Now, you've seen some bizarre yoga poses in this article that will literally stretch you to your limits. Yet this one just requires you to lie on your back, relax, and breathe. And believe it or not, the corpse pose, Is one of the most difficult out there. The biggest problem is not only being able to fully relax every muscle in your body but also to clear your mind completely and keep your breathing even. Once you master the corpse pose, it'll reward you with lots of health benefits. It can reduce blood pressure, fatigue, headache, and insomnia. And of course, it calms you down and get you ready for sleep like no other. Unfortunately, pregnant women and people with back problems won't be able to enjoy these benefits. They should stay far away from this pose. Next time you're having trouble drifting off to sleep, you'll have six secret weapons that will put an end to your insomnia. Have you tried any of these sleep-inducing yoga poses? If not! Which one can't you wait to try? Tell us in the comments below and help your friends out by sharing it with them. The best part to make your Nephrology Personal Statement Writing and Proofreading is Be sure to create all the smoothes of the residency personal statement avoided and everyone the synchronic linguistics and lexical construction is chosen properly. See here http://www.gastroenterologyfellowship.com/gastroenterology-fellowship-personal-statement-services/internal-medicine-and-gastroenterology/ to get step by step suggestion about this. I think most students who apply for the fellowship place don’t get the place. The only reason is their writing is not well. Here http://www.orthopedicresidency.com/15-common-orthopedic-residency-interview-questions-and-answers/ you will find Pulmonary Critical Care Fellowship Personal Statement Writing Tips. You have to show your background in your writing about it gastroenterology fellowship personal statement. check more info to find the way to gain the edge over your competitor. Here expert are giving opinion for you.